I received a request to do an overview of the costumes of Brittany [Breizh, Bretagne]. I do not know if this will be in time to help her with her class project, but I had been planning on doing this for a while in any case. 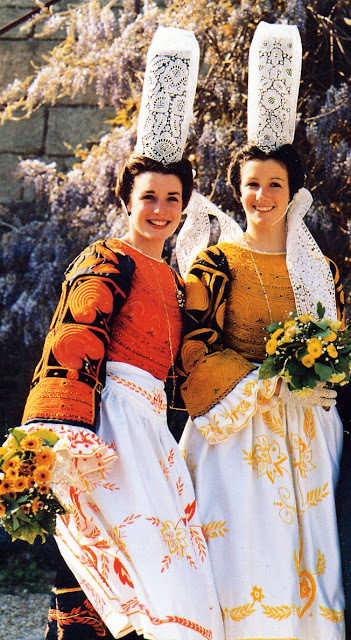 I have already done one in-depth article on the costume called Giz-Fouen from Rosparden. 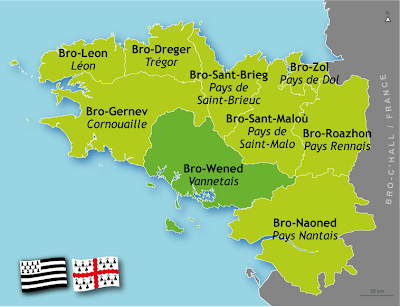 Brittany is traditionally divided into two parts, Lower Brittany and Upper Brittany. 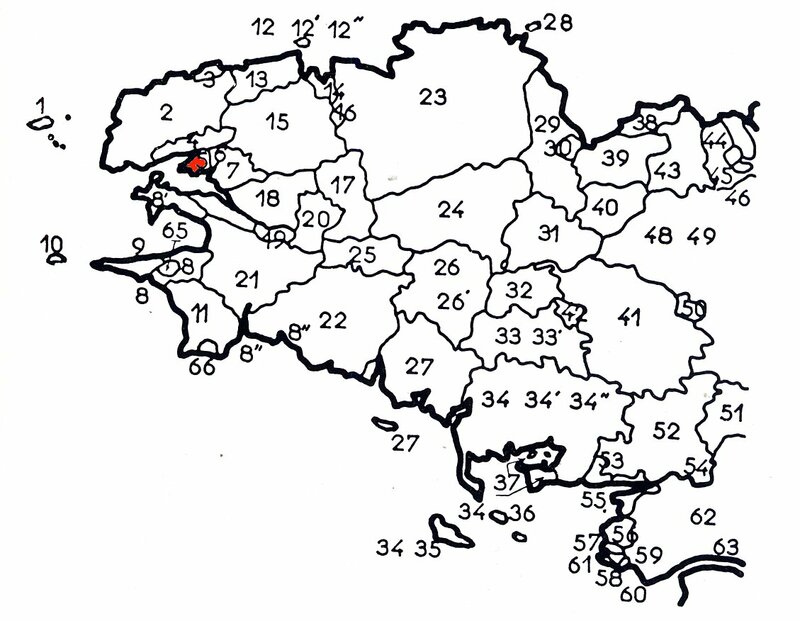 The lower and upper defined by altitude. 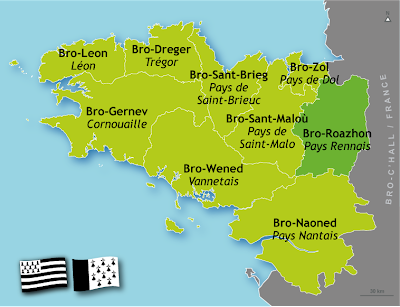 Lower Brittany is the western half, where the people speak the Breton Language, which derives from the same root as Welsh and Cornish. 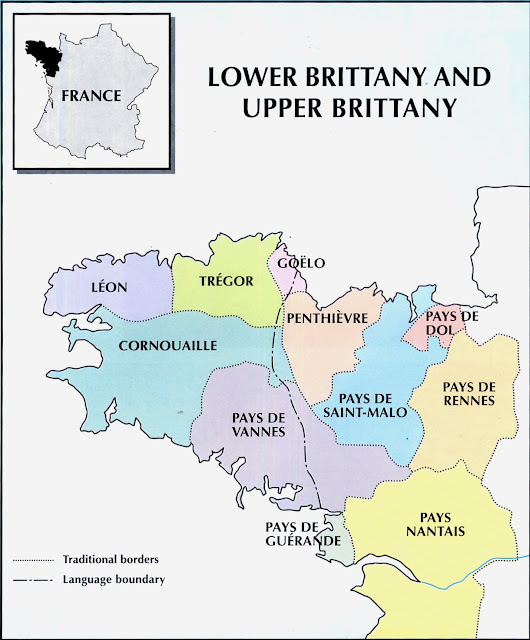 Upper Brittany is the eastern half, where the people speak French, and traditionally used the Gallo Language, which is also derived from Latin. The Breton Language has been retreating to the west for some centuries now. 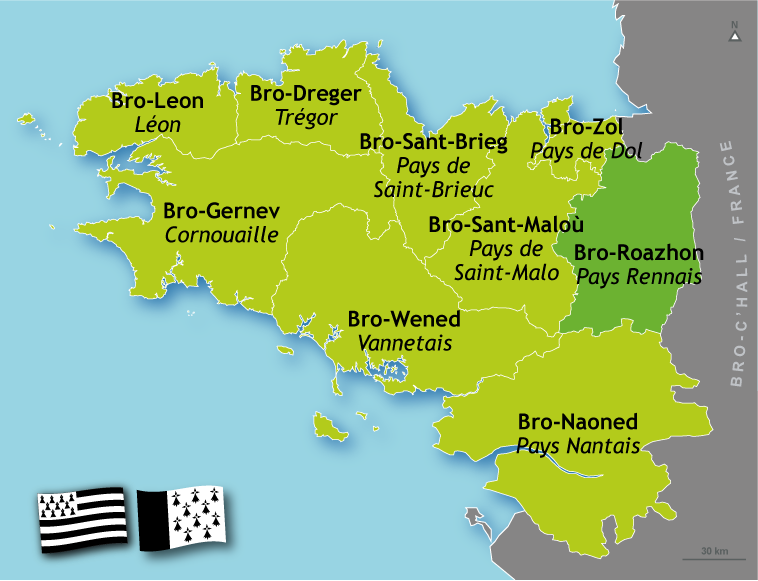 Here is a map showing upper and lower Brittany against the traditional provinces. 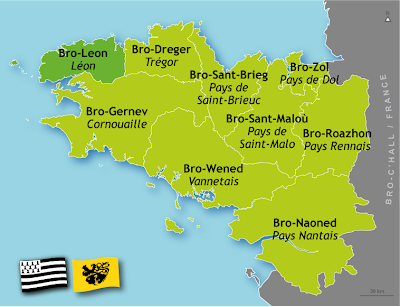 The second map gives the names of the provinces in the Breton Language as well as in French. 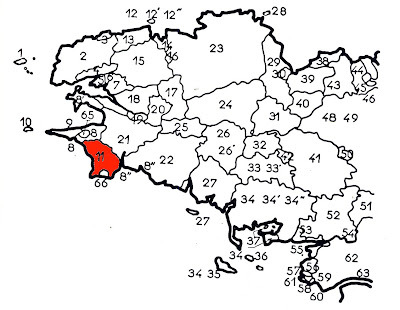 In France, as in many places, the traditional provinces or regions no longer have any legal standing, purely administrative districts have taken their place for legal and governmental purposes. 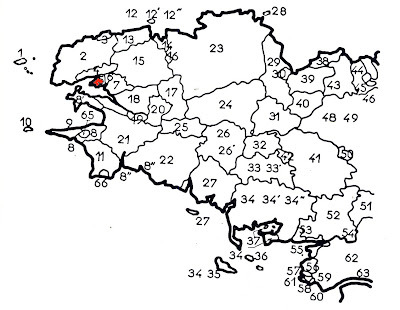 Some maps that you will see show these administrative regions rather than the traditional cultural regions. 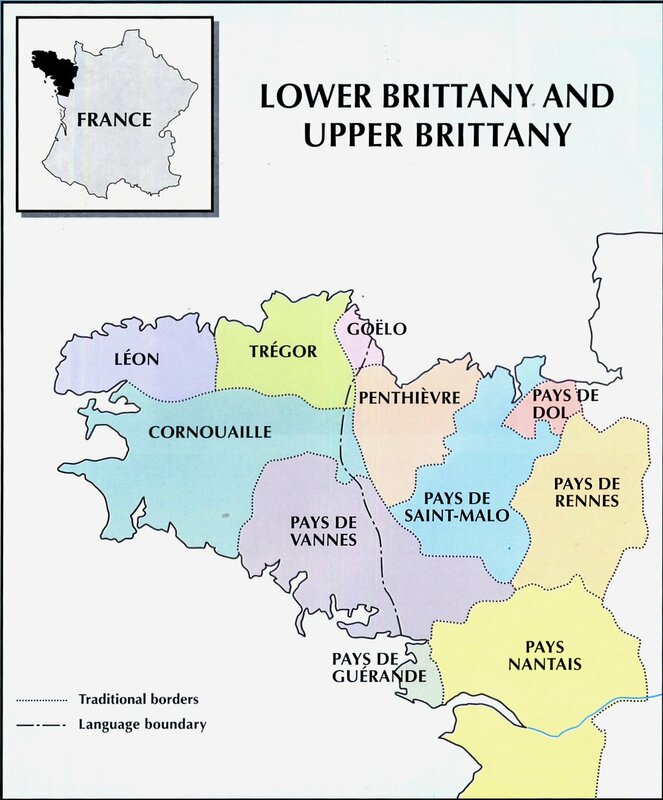 Brittany, or Little Britain, was settled by people from the Island of Great Britain who fled their homes during the Anglo-Saxon invasion. 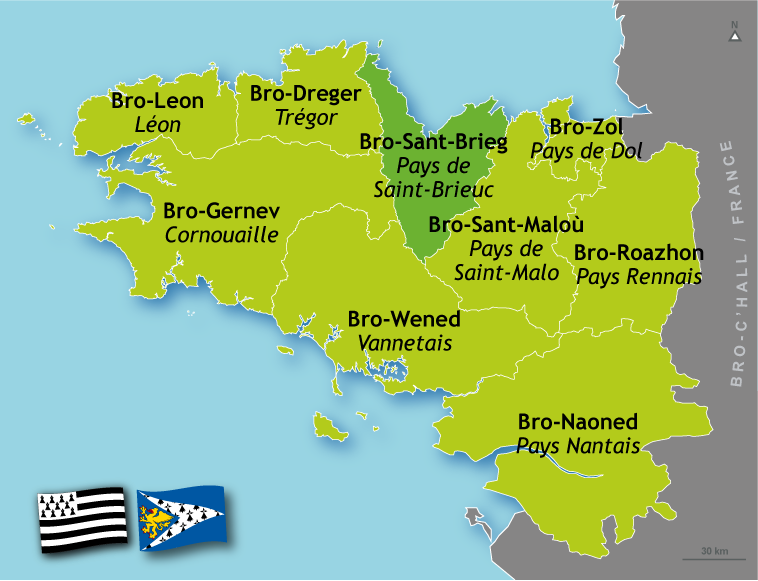 For more information about the History, Language and Culture of Brittany, see this article. There are many costumes in Brittanny, by some counts up to 66, but I will not be able to show them all, in fact I have not found images for all of them. They are also not evenly distributed, there being more costumes and more elaborate and colorful ones in the west. The four best known and most elaborate costumes are all from the western part of the province of Gernew [Cornouialle]. I will start with these. 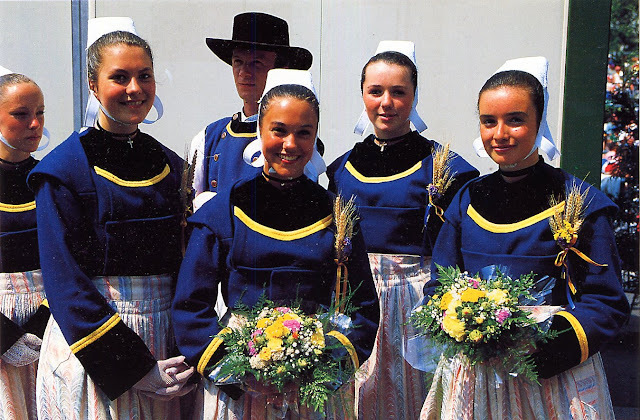 Giz-Fouen costume from the region of Rosporden and Pont-Aven. 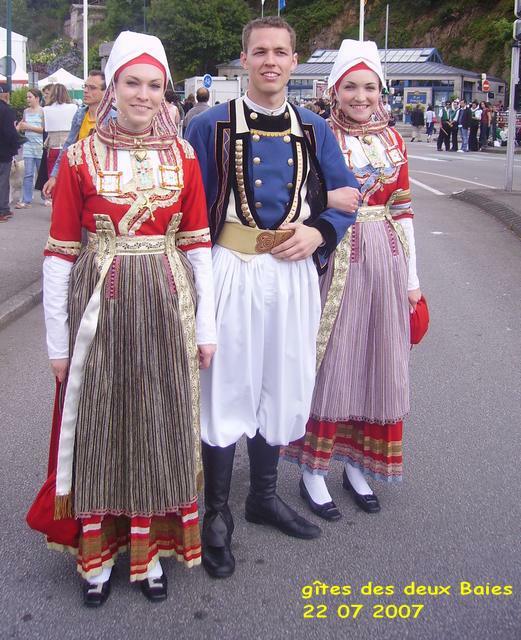 I have already done an in depth posting on this costume. 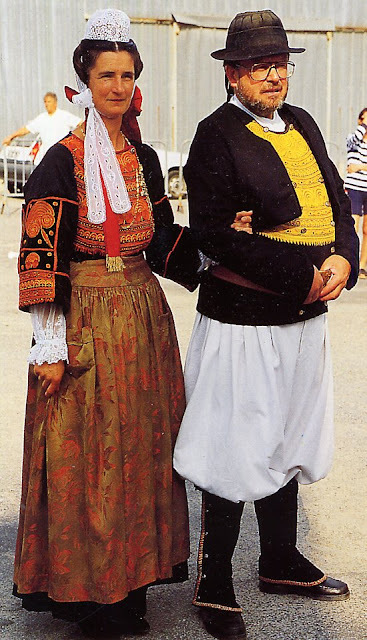 Here is the region and the costume itself. Bigouden Costume of Pont l'Abbe. This is perhaps the most famous costume and embroidery of Brittany. 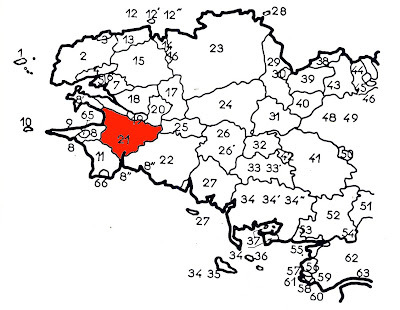 Here is the location of the region. 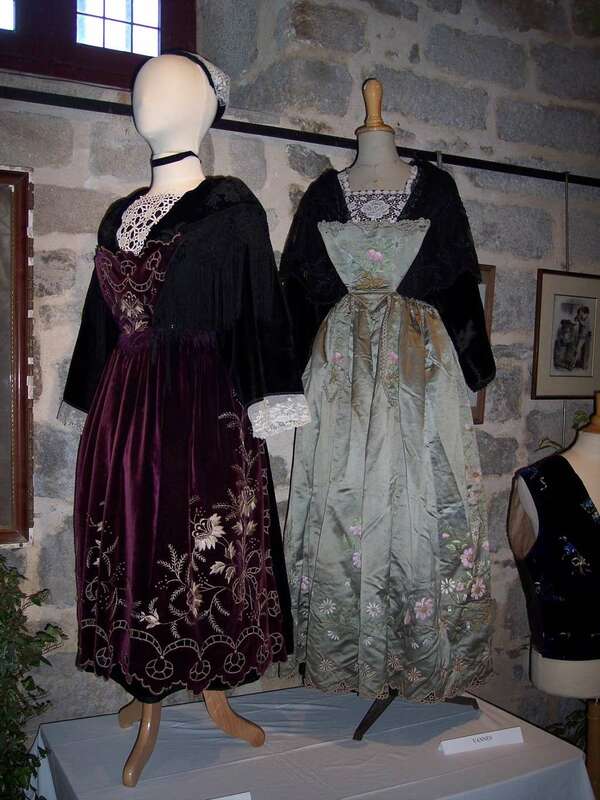 The photograph at the top of the article is of a professional embroiderer's shop in this region. 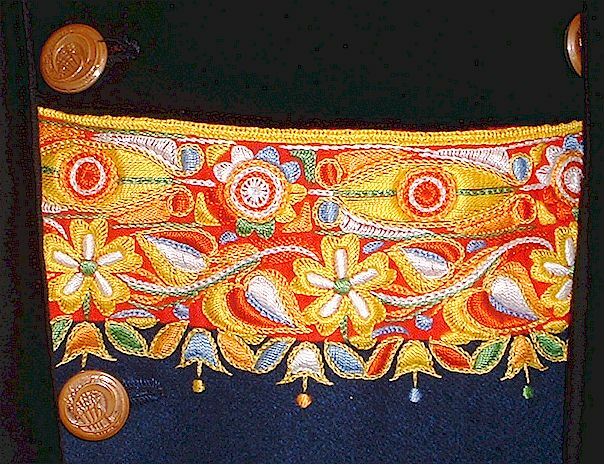 You can see the masses of embroidery on the garments they are working on. 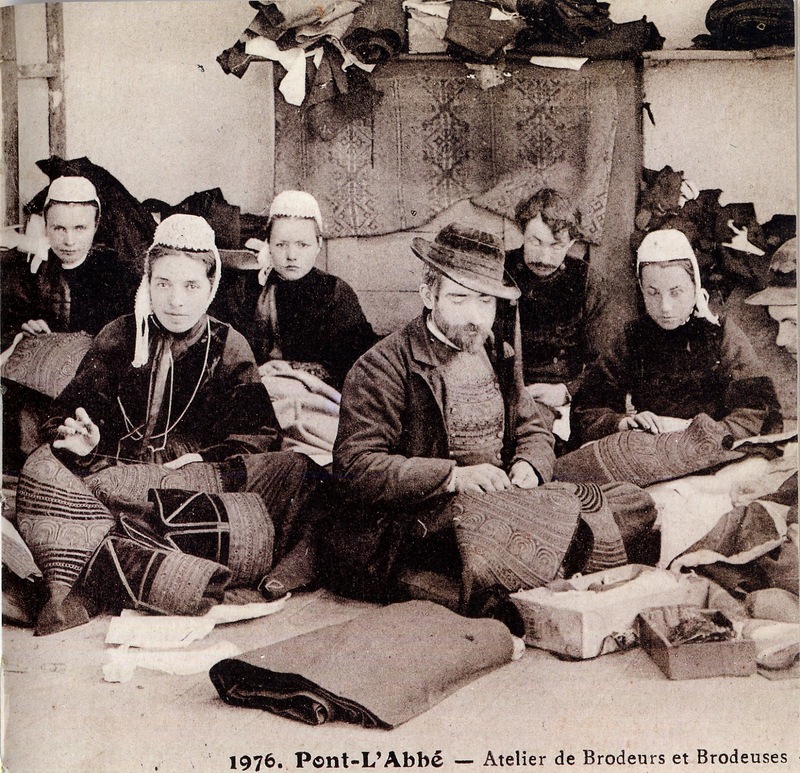 I find it interesting to see men also engaged in the embroidery. The costumes they are wearing are those of the end of the 19th cent. 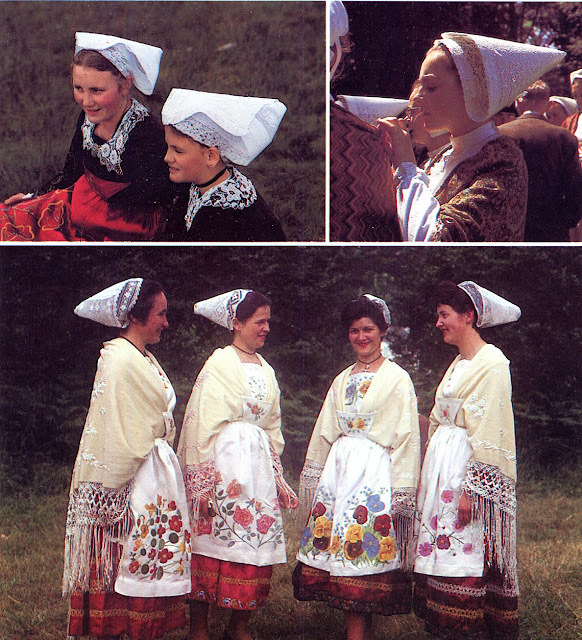 Here are a couple of photographs, even today some people prefer the old form of the costume. 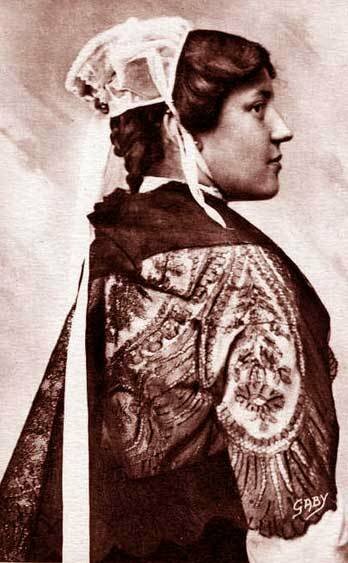 During the early part of the 20th century, the coif continued to grow until it reached monumental proportions. This continued until the advent of automobiles made it inconvenient. 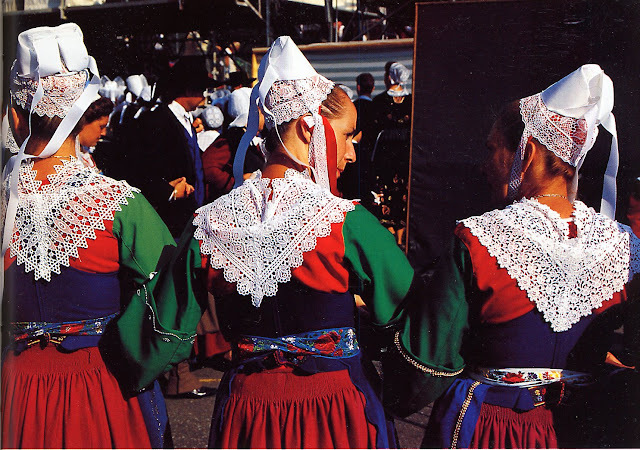 The skirts shortened, and the aprons became white with free-form embroidery. 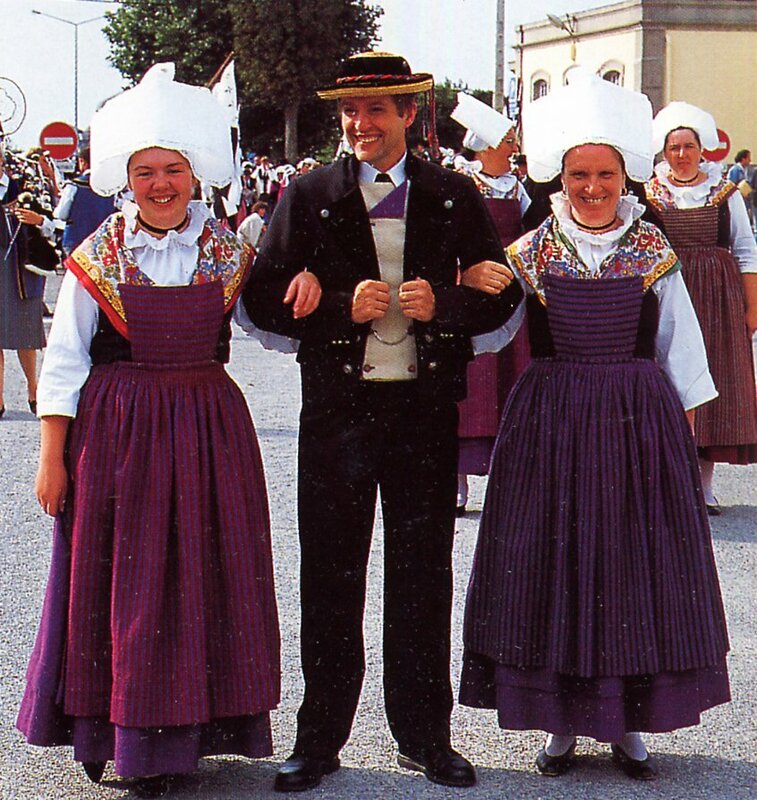 This is another well-known costume of Brittany, often featured on the famous pottery of the area. Here is the location of the region. 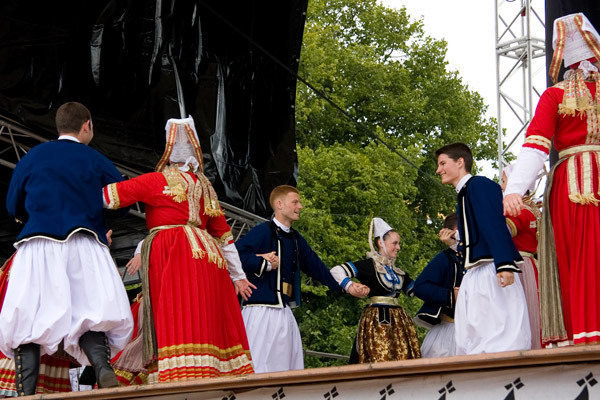 Here is a group performing at a festival in Poznan', Poland. 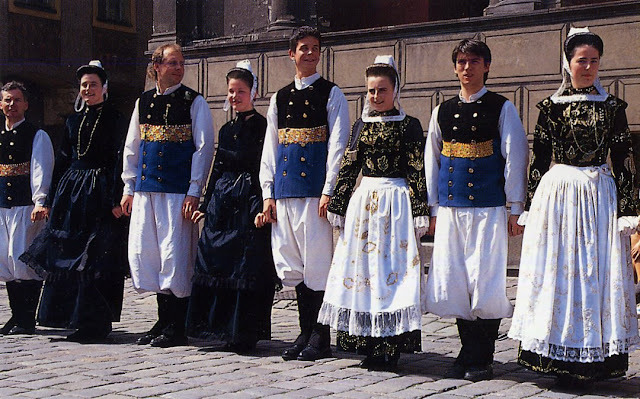 The exact form of the embroidery, especially on the men's vests, varies by the town. This costume has several variations, some of which are quite reserved. 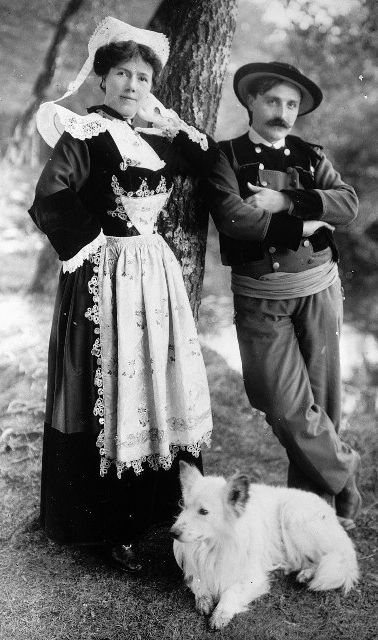 A jacket for the men is part of the costume as well. 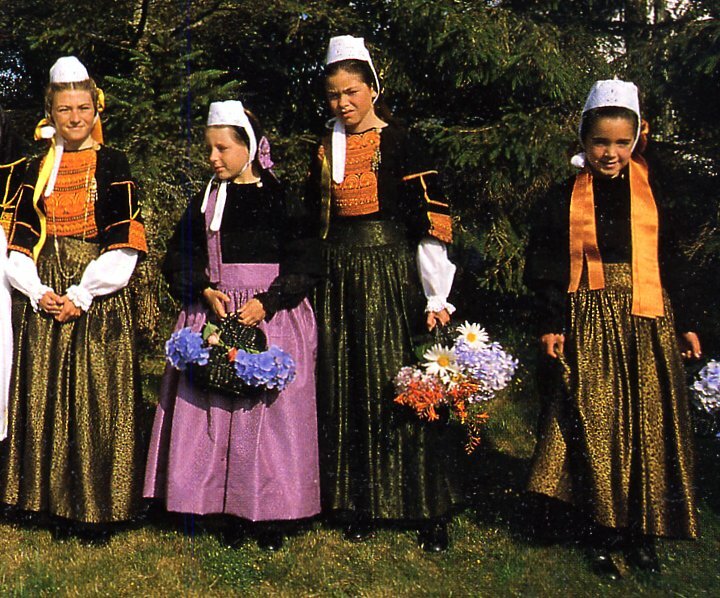 Alternatively, some versions of the costume are very colorful indeed, as this example from Kerfeunteun. This is one of the most colorful of all the costumes of Brittany. 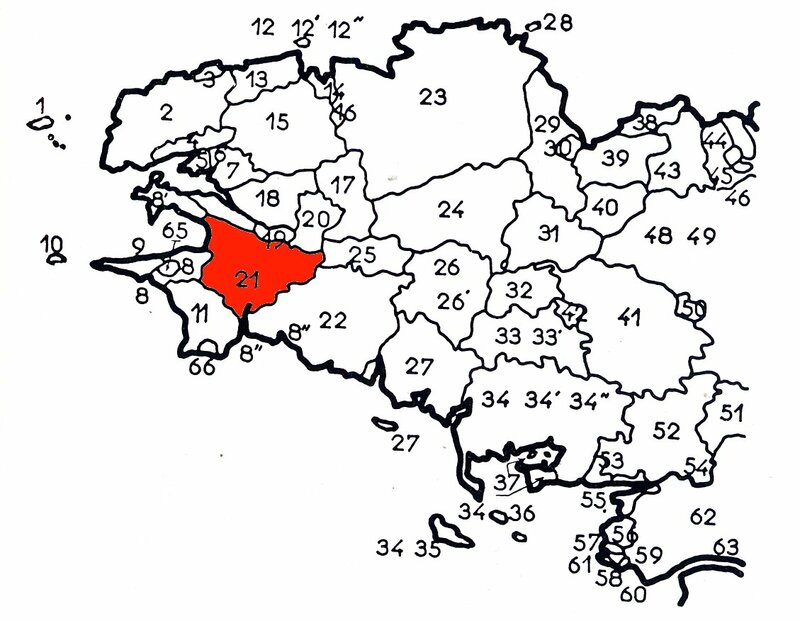 It is only found in the one city. 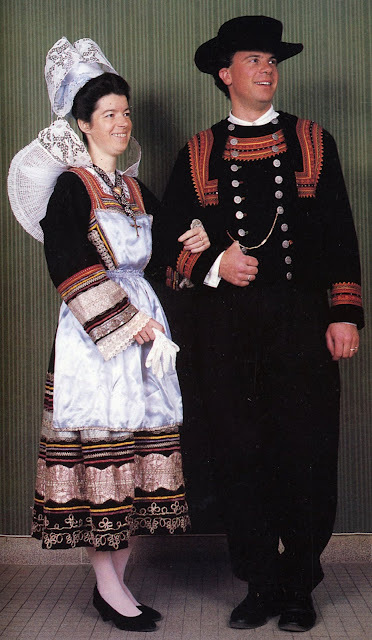 Here is an older form of the costume. Notice the rich lace and embroidery. Here is a more recent form. 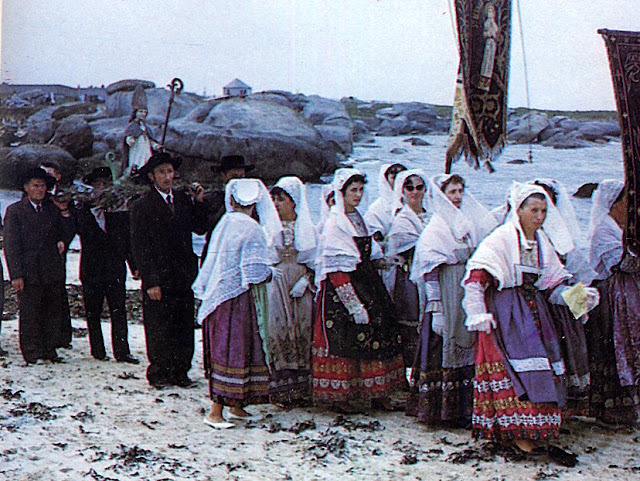 This costume is found in the regions of Brignogan and Plounéour-Trez on the mid-northern coast. 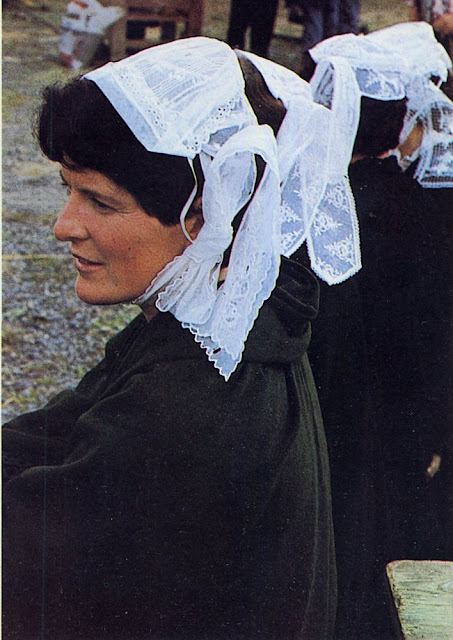 Kerlouan, just to the west of the above region, is famous for the cone-shaped coif. 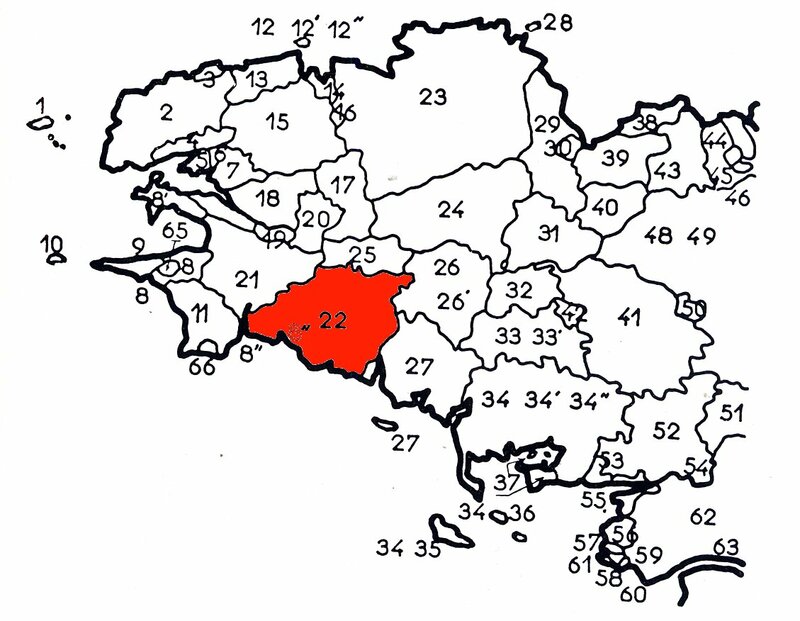 Saint-Pol-de-Léon in the northeast corner. Tregor is characterized by a small coif with two narrow wings, called the touken. 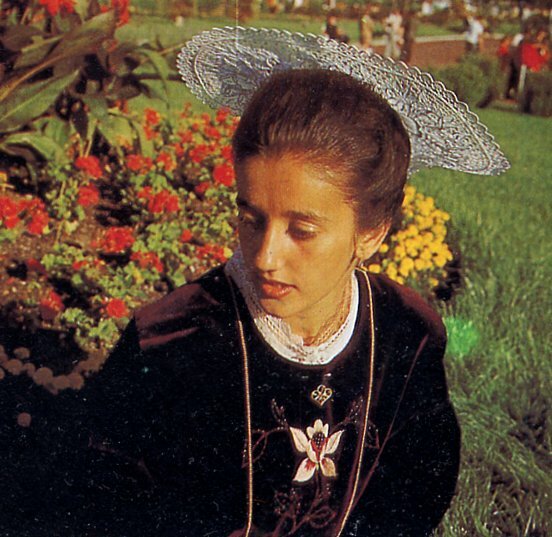 There is also a larger coif called the katiole. 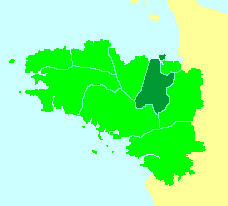 The Province of Gwened or Vannes. 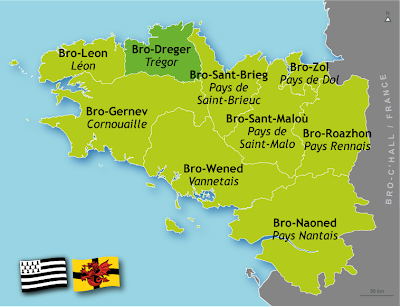 This province is named after Gwynedd in Wales, another remembrance of the roots of the people of Brittany. 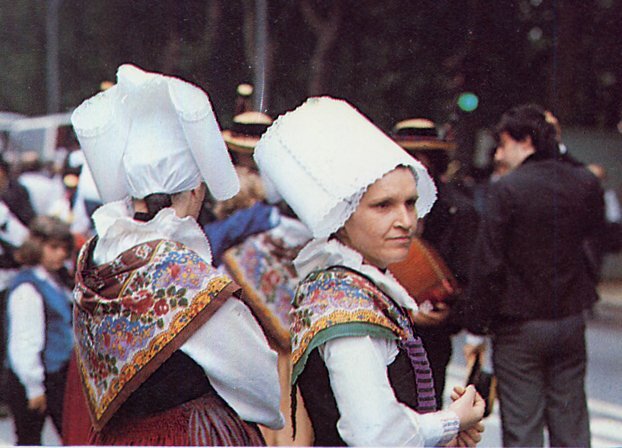 The costumes of Gwened or Vannes are characterized by a coif in which the front has developed a flat shield-like shape. 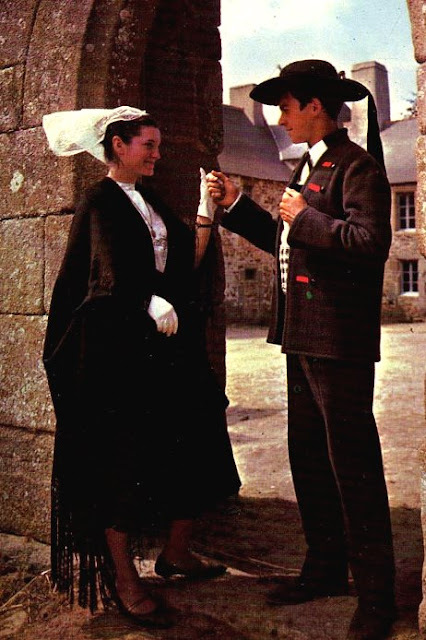 Here is an example from Auray. The costume of the Island of Groix, in the Lorient region. 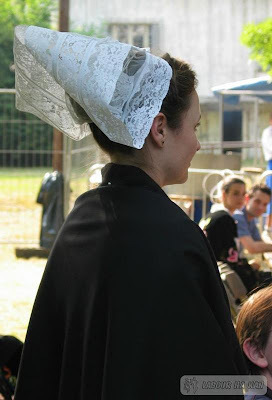 Sometimes the entire coif is made of lace which covers the side of the head. 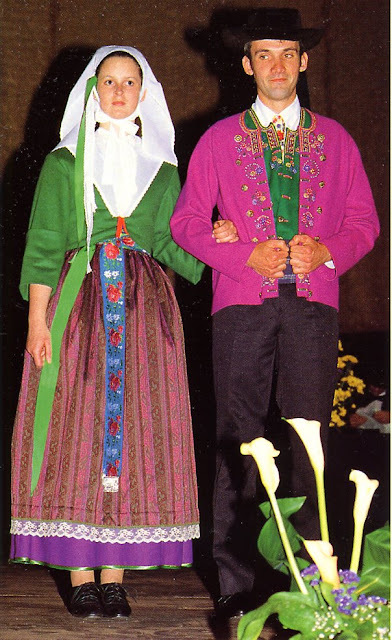 Here is the costume of Baud. Sometimes the pinafore apron is highly embroidered. The dances here are just as active and spectacular as in other parts of Brittany. This is the Groupe de Pontivy performing the Gavotte du Pays Pourlet. 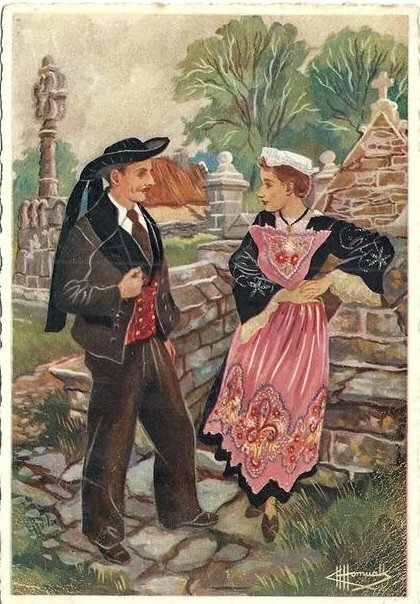 There is much less costume material available from Upper Brittany. 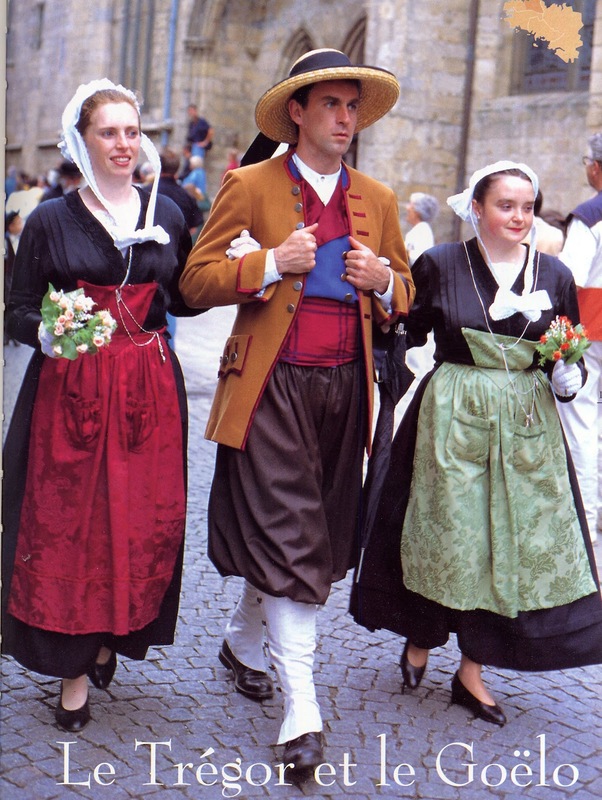 There is also much less variety in the costumes. 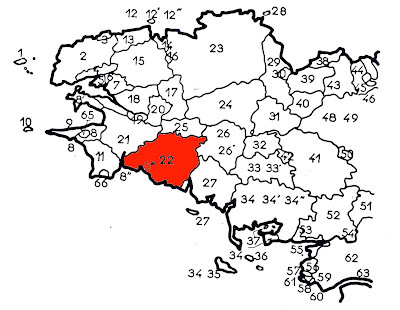 I here present what I have been able to find by province. 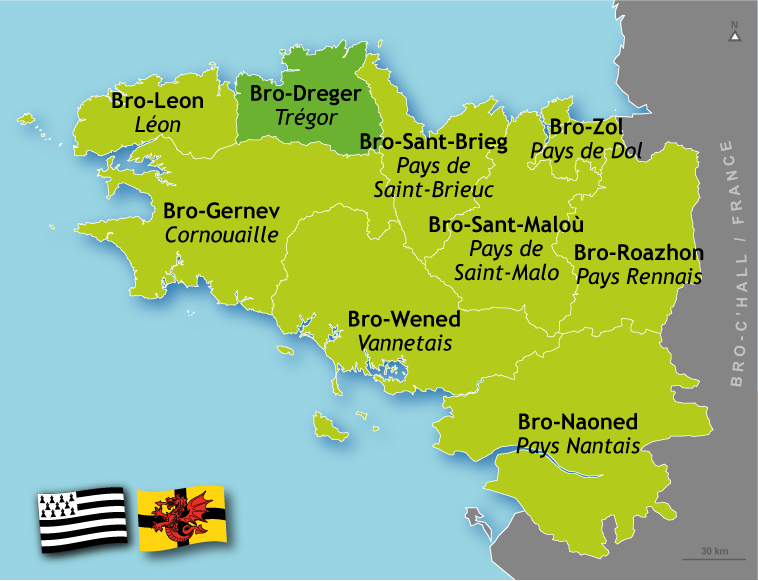 The Province of Sant Brieg [in French, Saint Brieuc or Penthievre]. This is an example of the Burgher's or Town Costume, widespread among the various folklorique groups of Upper Brittany. 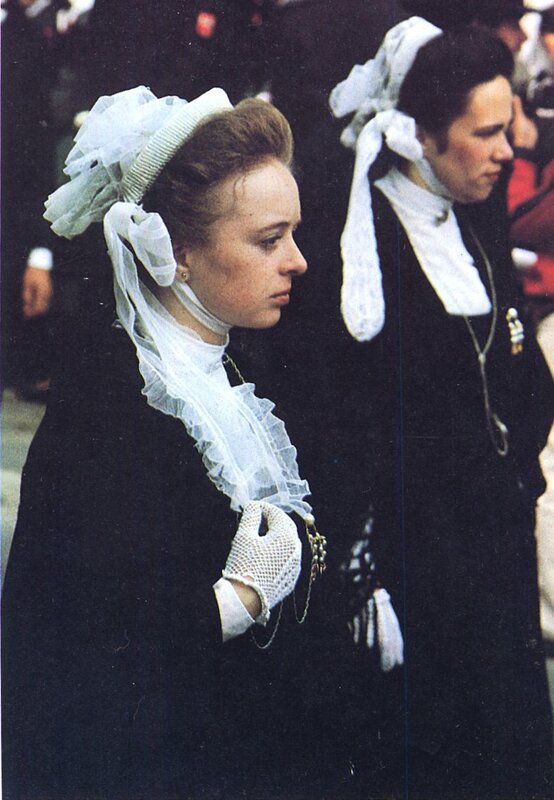 Notice the coif has the side lappets folded over the top and pinned in place. 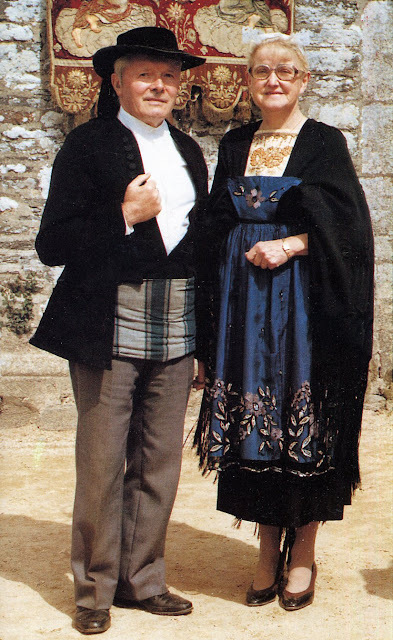 Also notice the triskelion on her neckband. 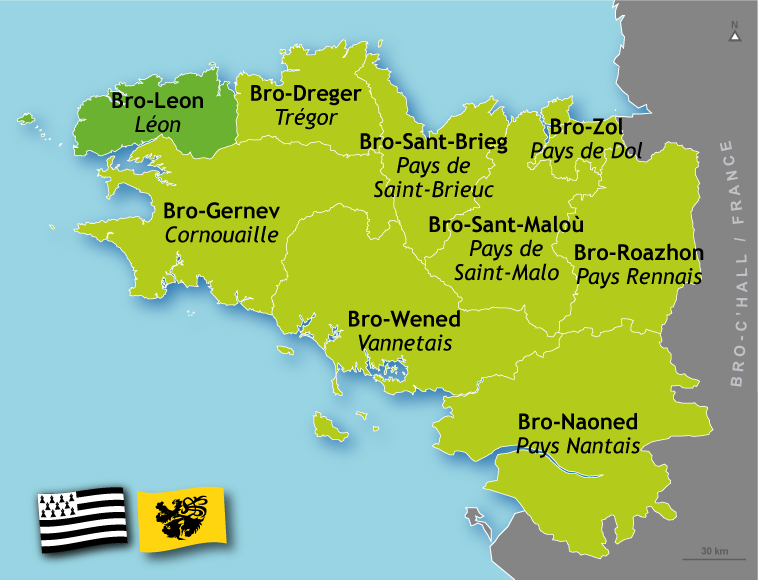 This is a very Celtic symbol and one of the National symbols of Breizh [Brittany]. This is a small province with a very colorful and unique costume. 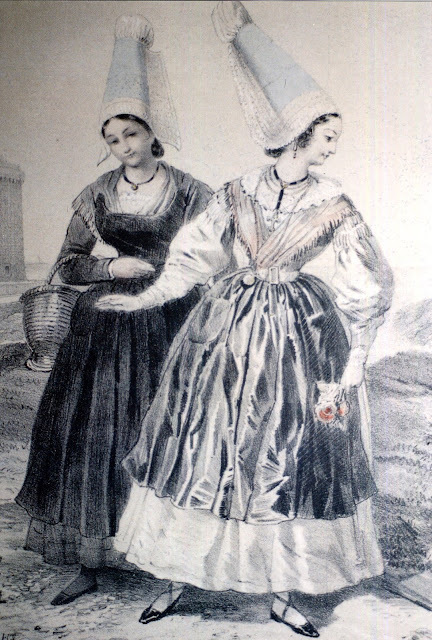 This is known as the costume of the Marsh-Dwellers. 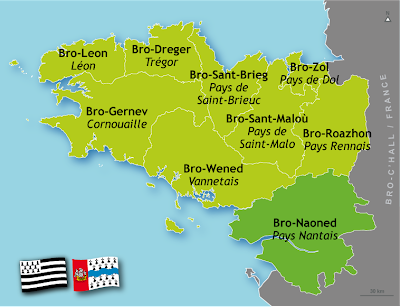 When the French Government instituted the Departements [administrative regions] to replace the old traditional Provinces, they removed the Bro-Naonaid [pays de Nantes] from Brittany and made it administratively part of the Departement of Loire-Atlantique. 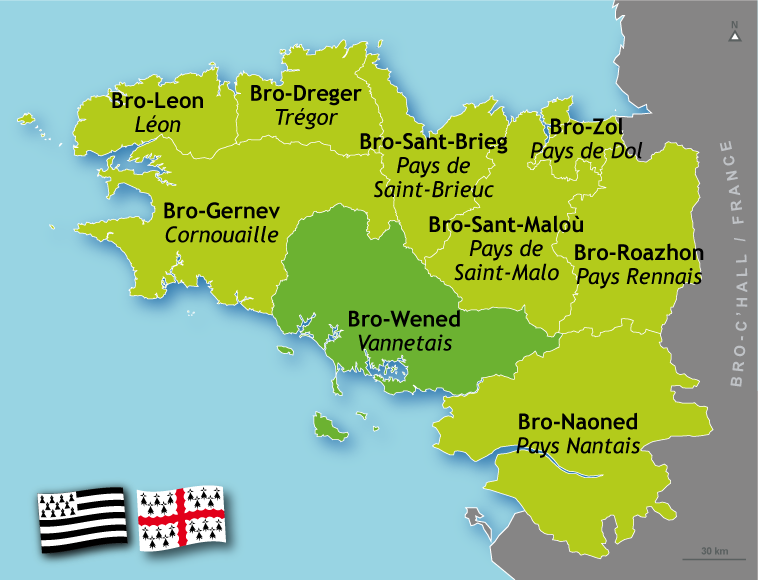 The people of Brittany still consider it to be an integral part of their land, however. 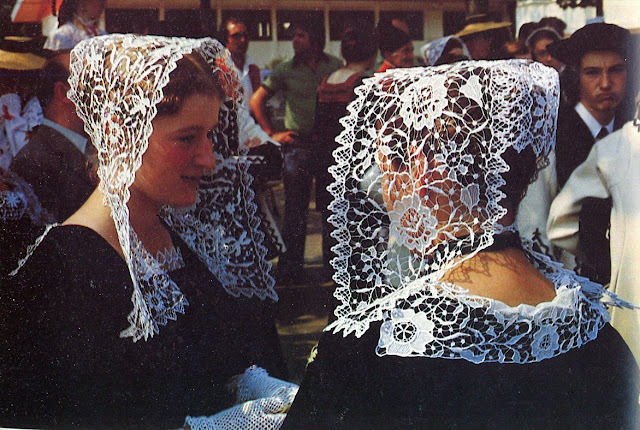 Historically, the women of Nantes wore a very high coif, somewhat reminiscent of those of Normandy. 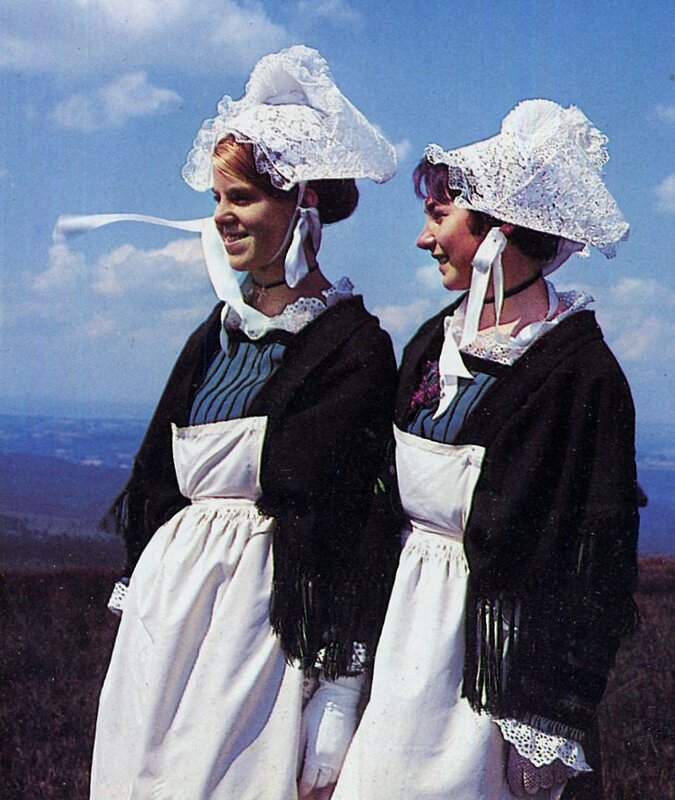 Here is an image of a couple of girls from Pornic, mid 1800's. 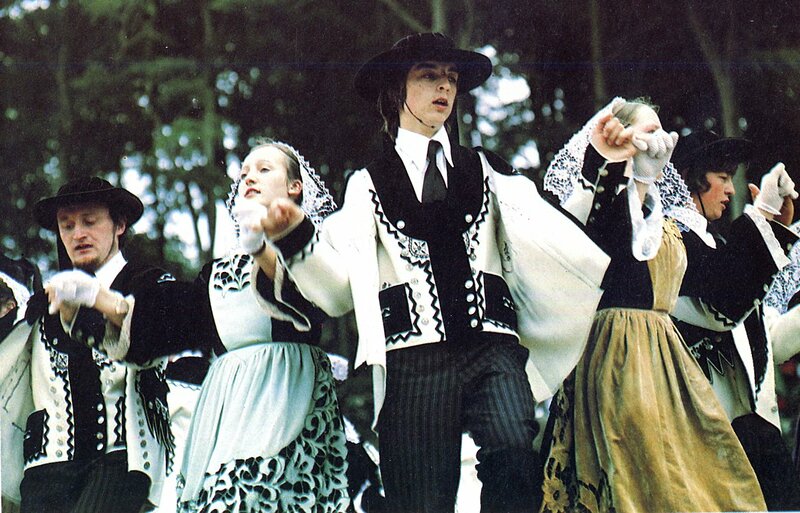 Here is the costume of a folkloric group in Vertou. 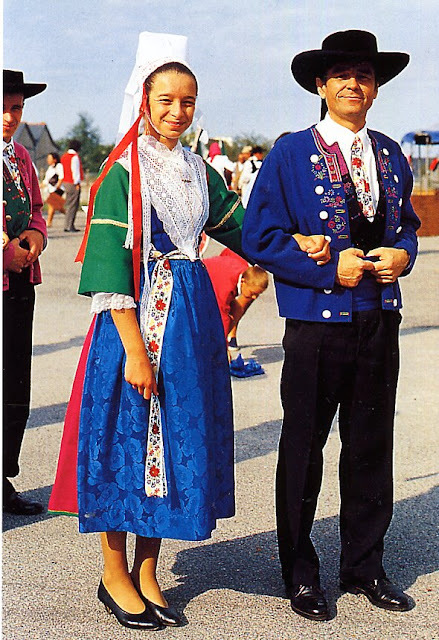 They did a very good job of researching their local materials to make this outfit. You can see many details on their website. 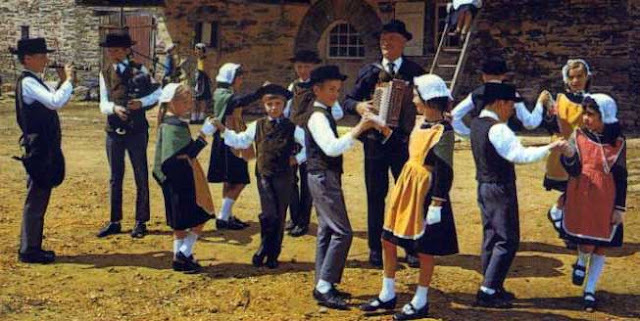 A children's perfoming group from Jans. 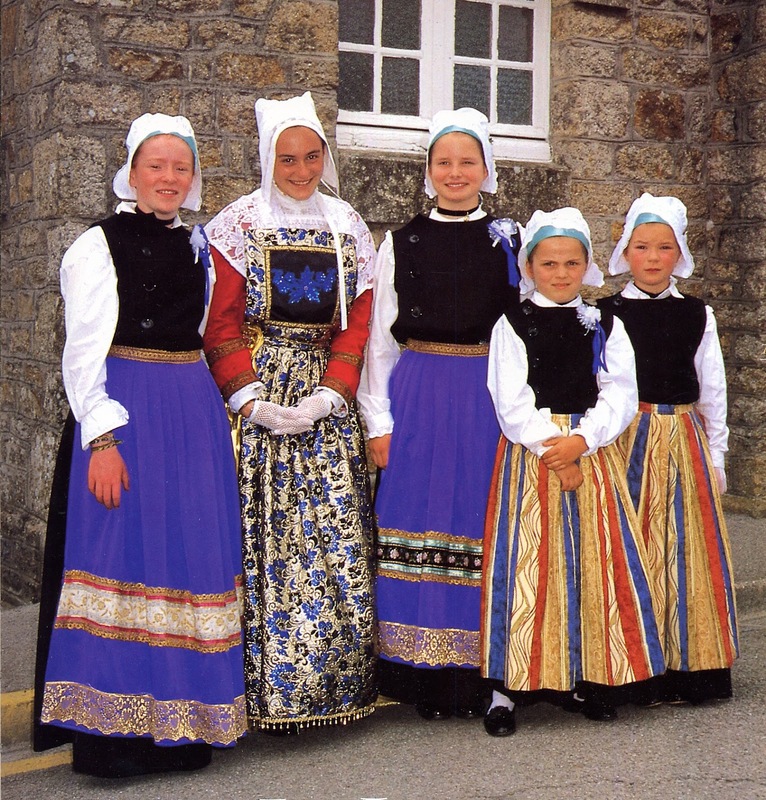 As in many children's groups from many countries, the skirts have been shortened far beyond what any adult would wear. A simple bonnet is worn instead of the adult coif, which is common in many areas. 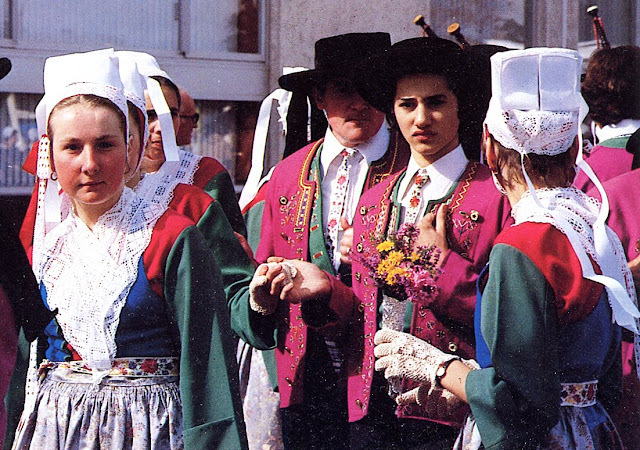 Coif and costume from the area of Clisson. 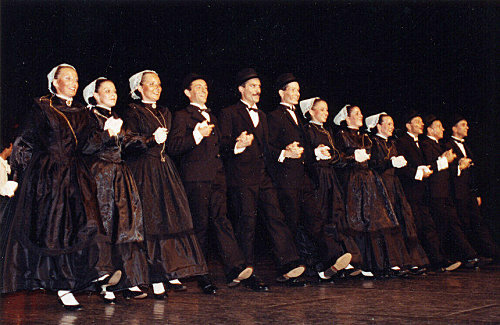 Town costume of Nantes itself as presented by the performing group Bleuniadur. I would like to emphasize that this is not a comprehensive listing. 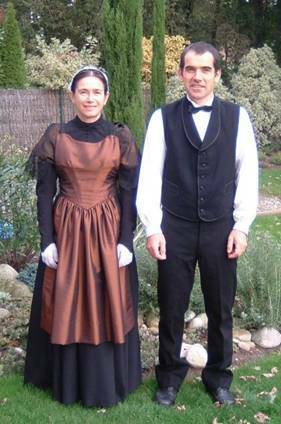 There are yet other costumes which I have not covered. I couldn't express how much I love those lace headdresses! And so many varieties of it! :D Are they starched to keep their shape? 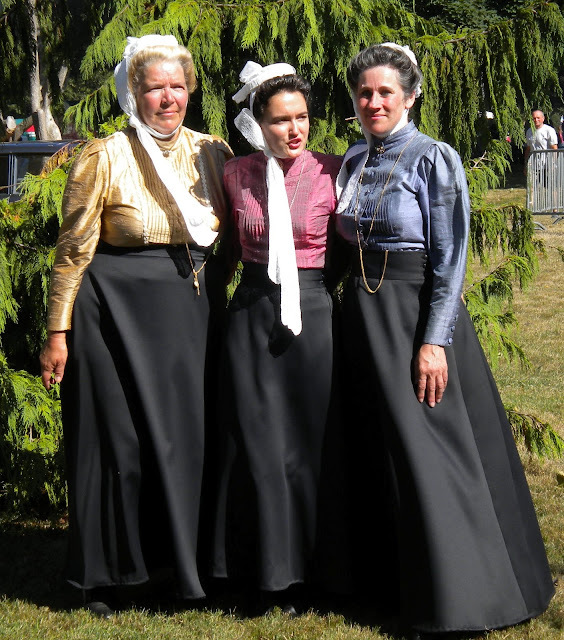 Oh yes, they most certainly are starched, and that has to be renewed from time to time. There are actually more varieties than those which I showed. What a great post. I saw postcards of these high lace head dresses in Normandy last summer and always wanted to know more. Thank you! Normandy has an entirely different set of headdresses. 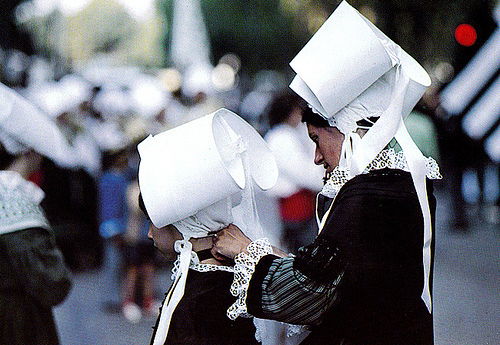 Some of which hold their shape by means of a wire framework. 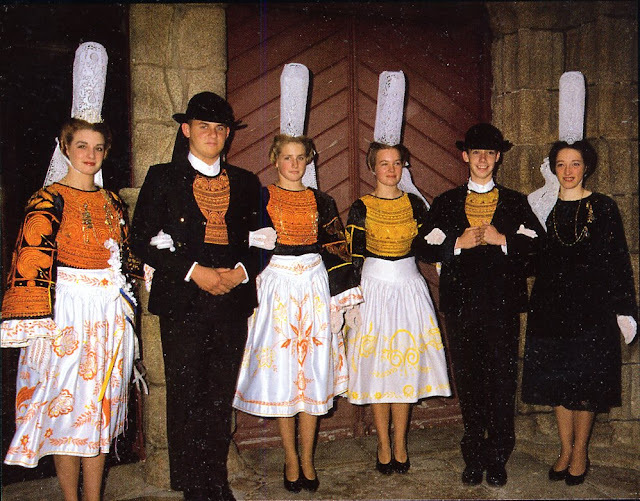 There are also yet other coifs in other parts of France. Thank you so much for this amazing research. Absolutely fascinating. 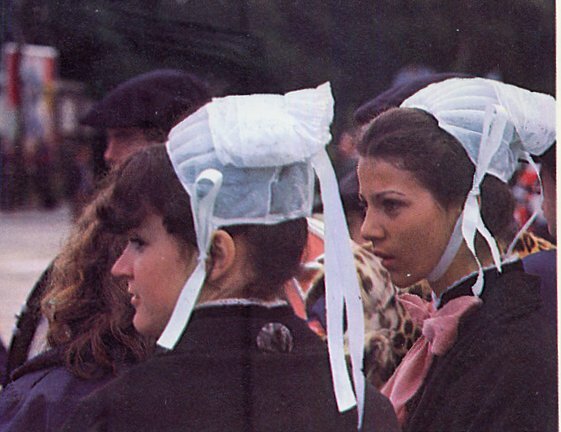 I am wondering- are there still people who make these headdresses? Is it an endangered art? And would you know of a museum that has some of these items in their collection in Germany? 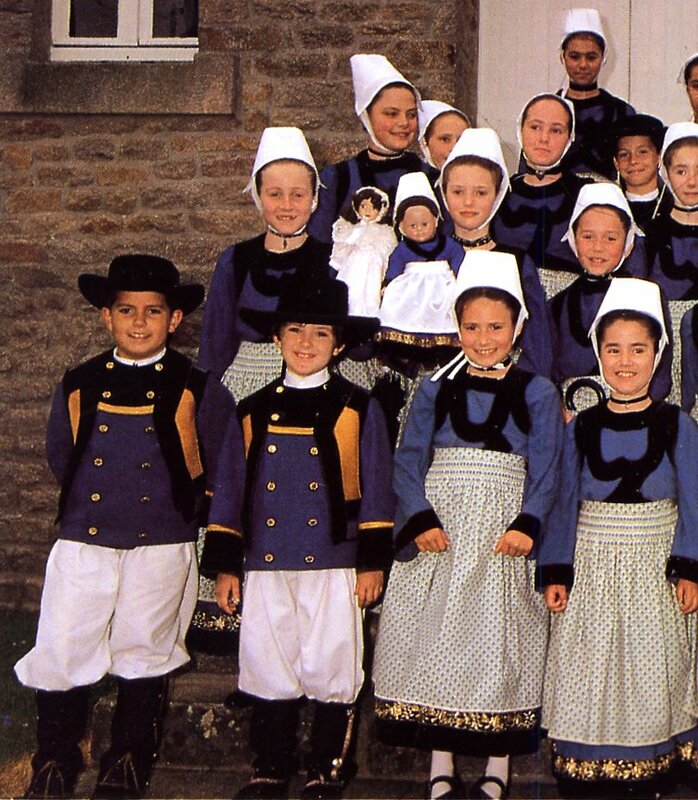 I first went to Brittany at the age of 10 with my family. 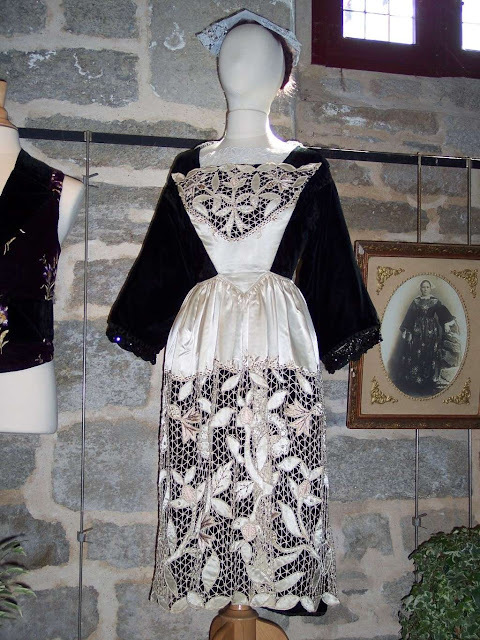 We stayed in several beach resorts over the years and I became more and more fascinated with the lacey Breton coiffes and embroidered costumes. 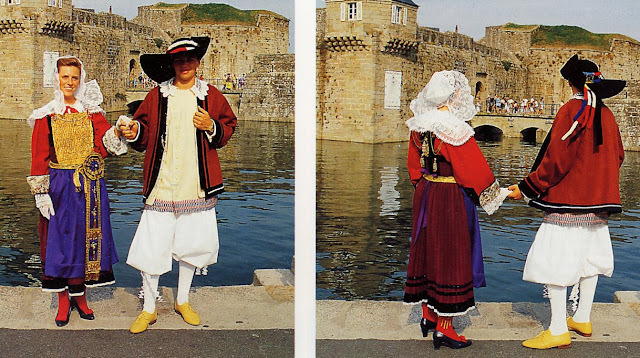 Then one year we were able to attend the Fete Des Filets Bleus at Concarneau. Many different Breton costumes and coiffes right before my eyes! 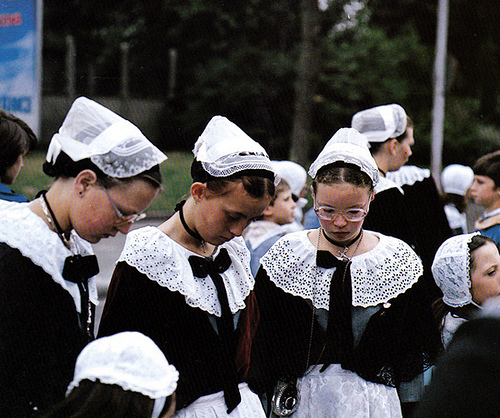 I think there is still quite a demand for the coiffes to be made, as there are quite a few folklore events like Fete Des Filets Bleus every year in France. Thank you for producing such a great blog on this subject. 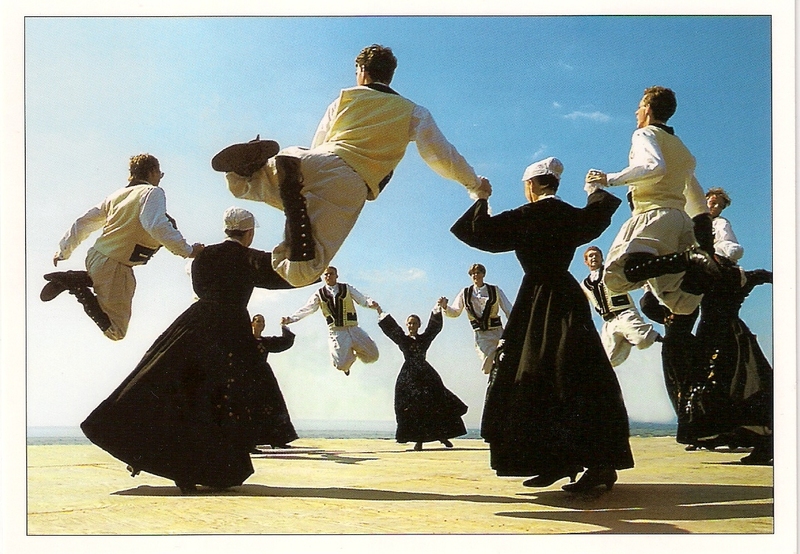 This is my heritage I want so much to be a part of this. Sadly I only have one uncle left living and then all my history will be lost. Thank you so much for this great work ! I found each Bro of Breizh, especially my Bro Wened ! 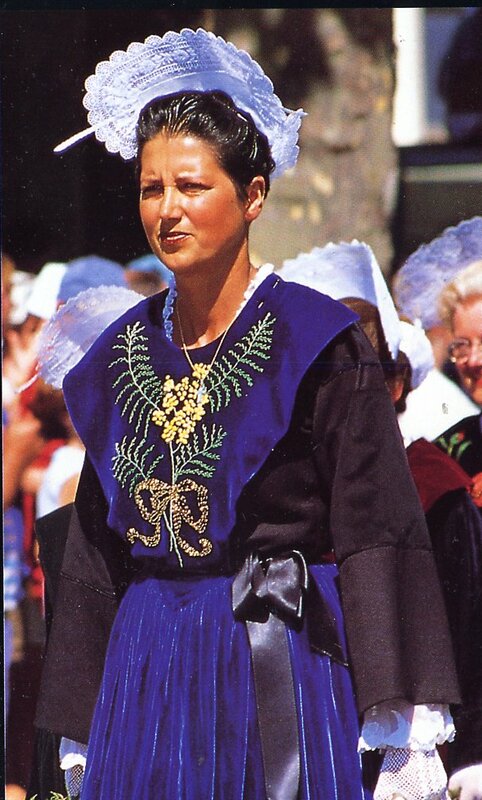 You have missed the beautiful coiffe fouesnantaise from the town of Fouesnant. 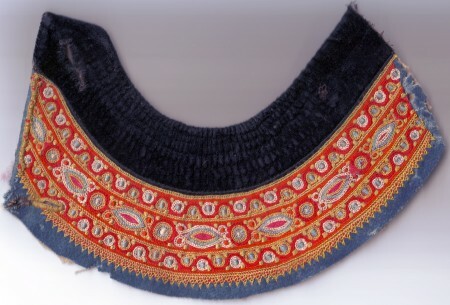 It looks like a crown, with ribbons. You can find many fine photos of this coiffe on Google. I have just retuned from the Grand Pardon Set Anne Palud. 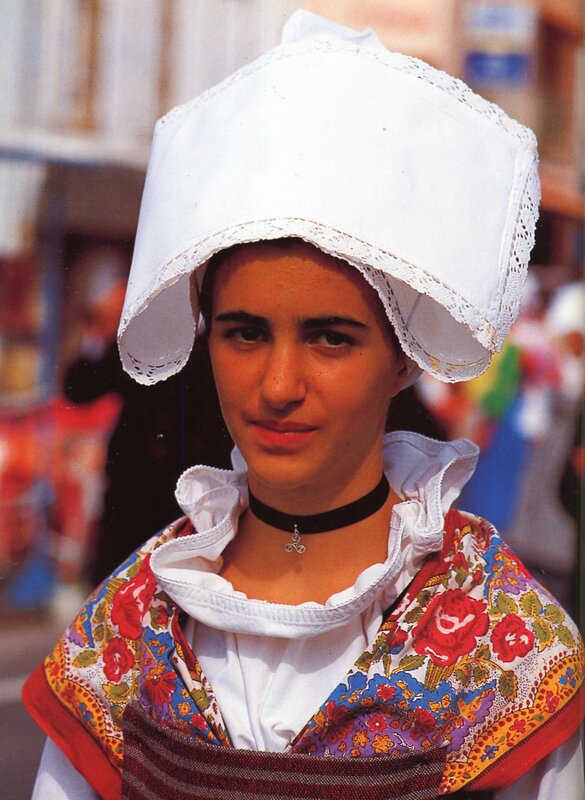 I so enjoyed not only the beautiful traditional costumes but also the community spirit which still exists. I visited one or two museums and was so excited by the intricate embroidery that I did not look sufficiently carefully as to determine the material used! 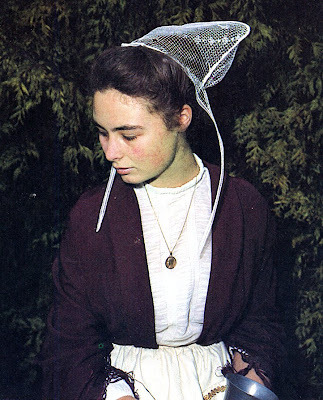 I have studied my photographs carefully but cannot decide whether it is a type of woollen gaberdine backed with a calico or whether in some places silk has been superimposed on the basic material.